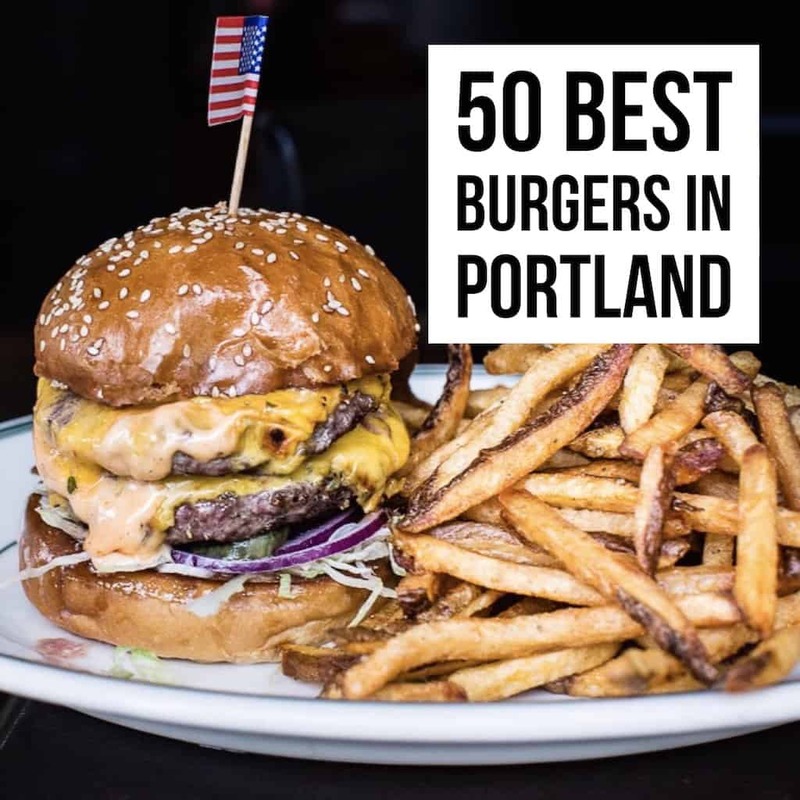 I am very excited to share with you my passion project and this year’s list of 50 Best Burgers in Portland. 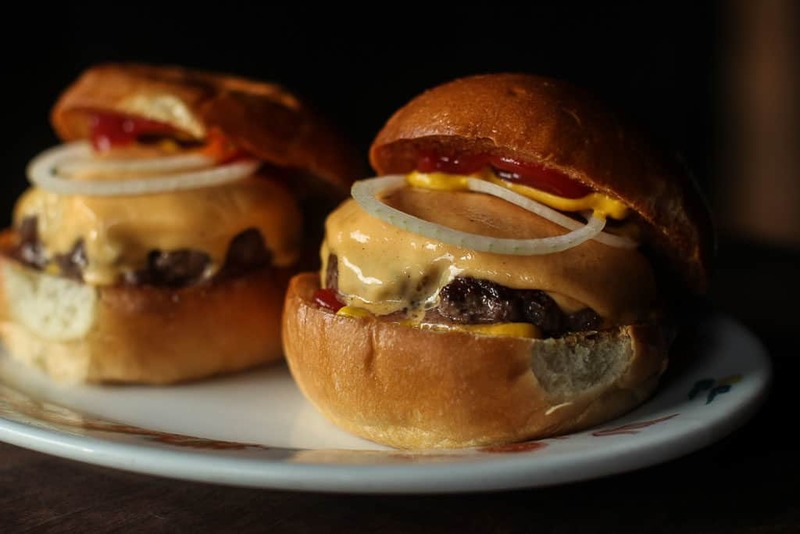 It’s been a long but worthwhile project, spanning 10 months and over 100 burgers. 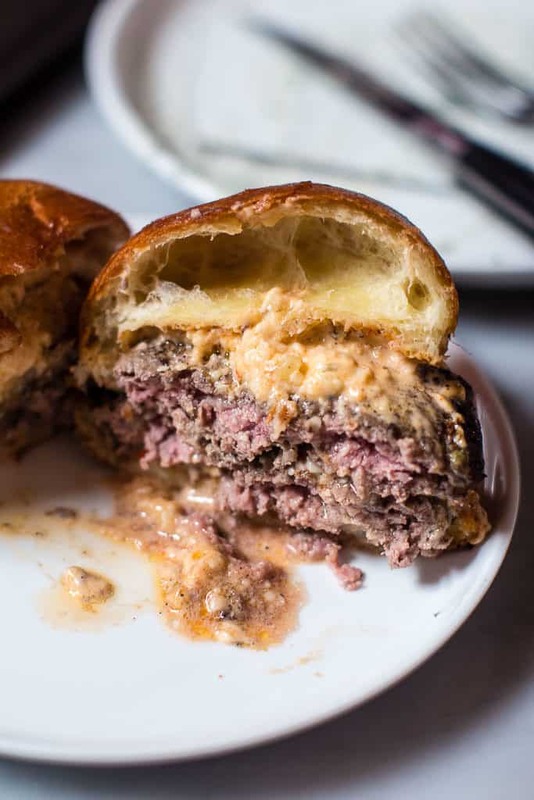 To usher in the proper reverence, let’s consider my favorite burger quote from my friend the esteemed, late food writer Josh Ozersky: “The burger is omnipotent and irresistible . . . it can never be weakened, it can never be slowed down, it can never stop. 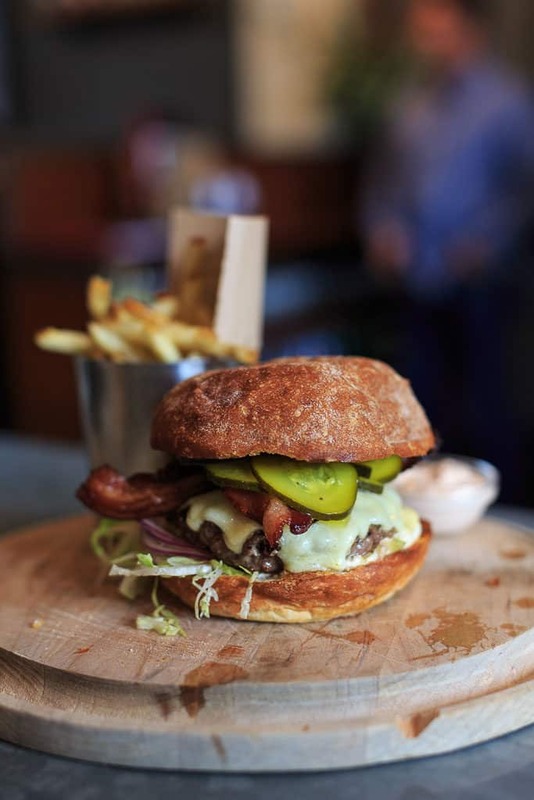 The burger is the most single powerful force in the food universe.” Indeed. 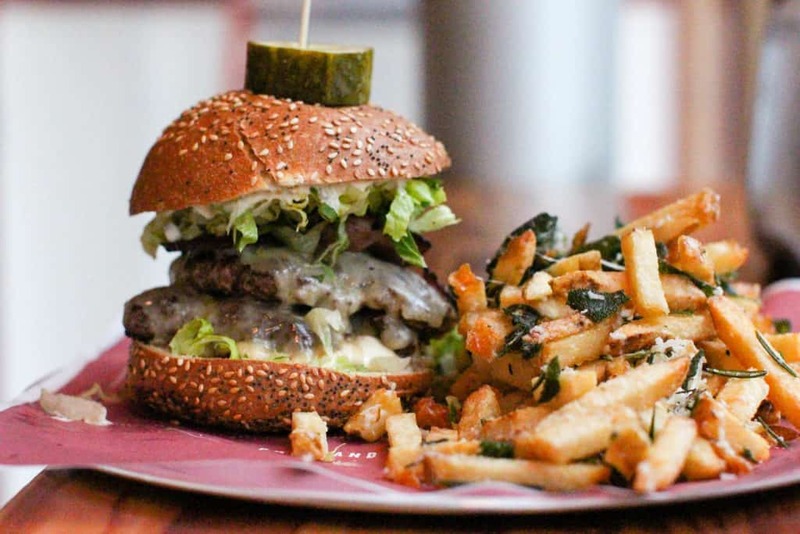 The process of burger categorization and ranking is not hard science. 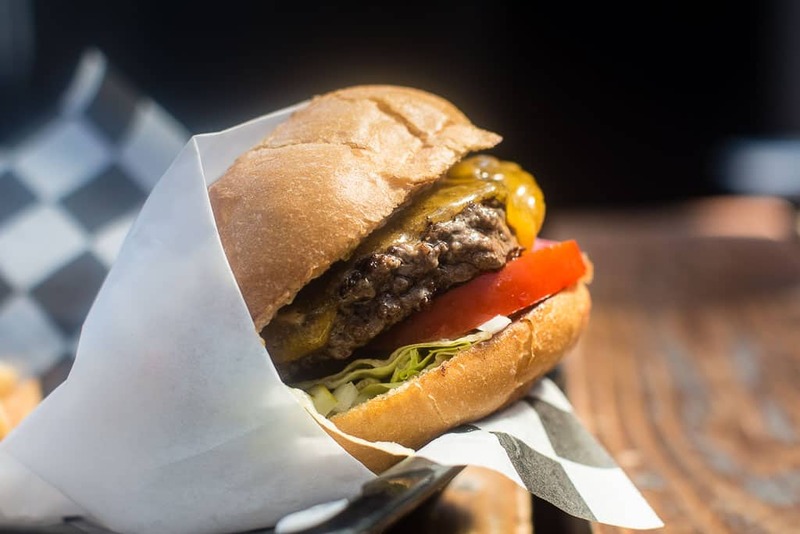 Naming Portland’s best burgers is necessarily subjective and trying to define and label burgers can get somewhat unruly, but I have tried my best to taste all of the great Portland burgers I’ve either read about or that have been recommended to me. I did not include places outside Portland proper, nor any chains. 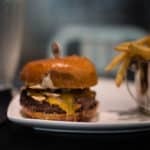 Soon after visiting Trifecta Tavern I noticed a trend of this style of burger everywhere — the double patty, saucey, nearly no vedge burger. 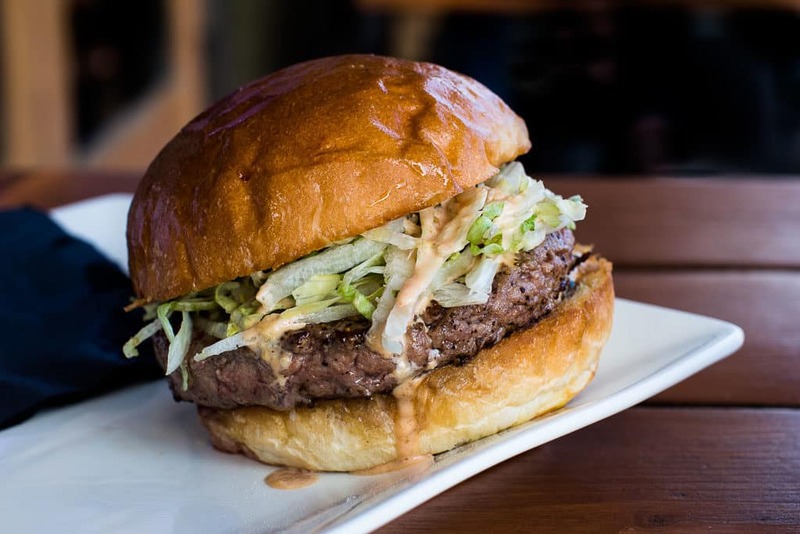 I am notoriously late to parties so I have no idea when this burger type was born or started to propogate in Portland. Trifecta’s burger is at the top of my list because the meat had a nice, semi-loose grind, it arrived screaming hot, it gave off puddles of juice, it had no vegetal elements to compete with the flavor of the beef, the brioche bun was freshly baked and therefore not dry or too light like most brioche buns, and the cheesy pimento sauce was outstandingly flavorful and generously applied. 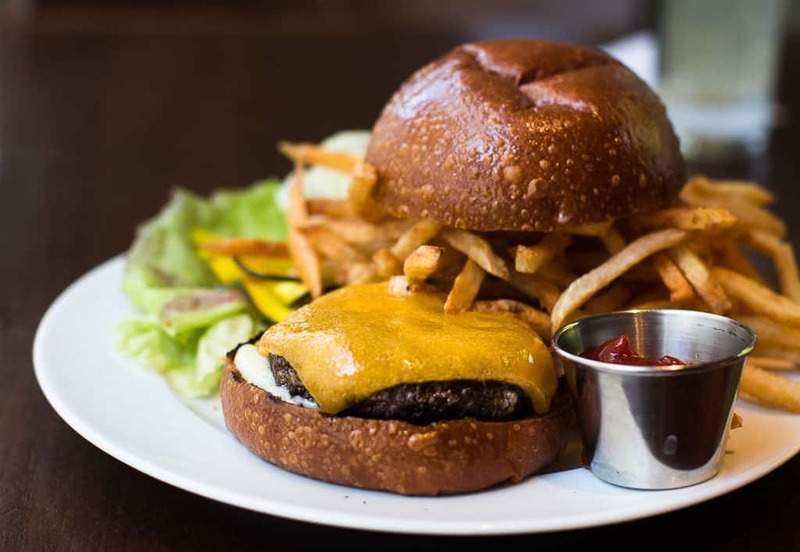 I would return again and again to Trifecta Tavern for this burger. 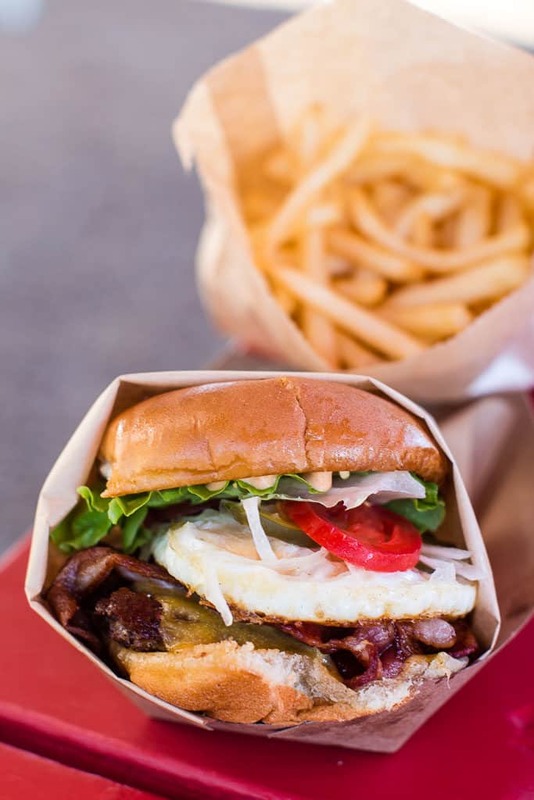 I’m still thinking about my Burger Stevens burger. I am a big fan of the self-employed chef who’s broken from corporate restaurant tethers and out there pounding the pavement to follow a passion and a calling, so when I read about chef Don Salamone, who’s done his time with Michelin-starred restaurants, and his wife Kate opening up Burger Stevens in a little blue food truck in a pod on the corner of Wilson High School in Hillsdale, I knew I had to make a visit. 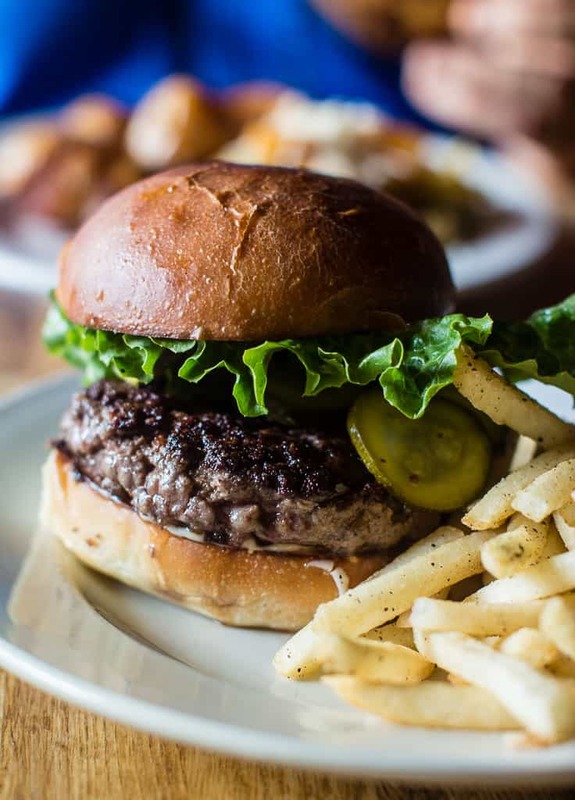 This burger took a while, but was well worth it. 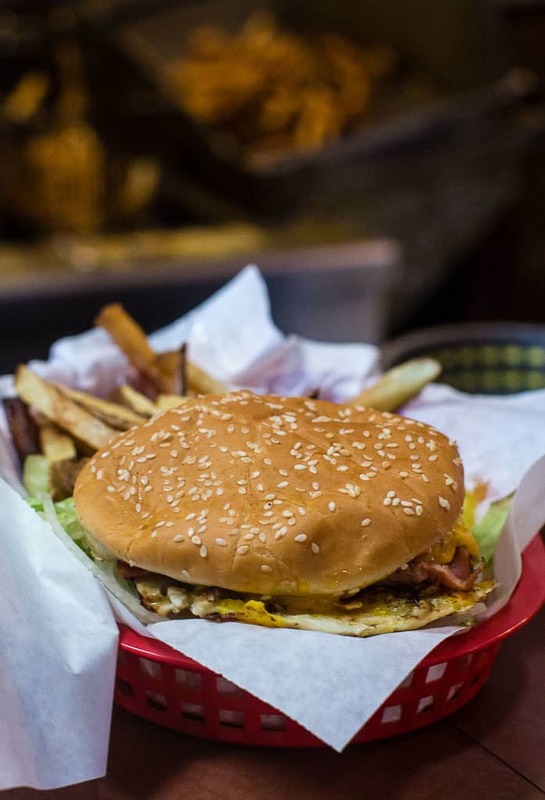 A classic old-school burger, cooked on a flat top griddle with a nice firm crust and wrapped in a paper package, Burger Stevens’ burger was a study in perfect construction: thin burger, crisp lettuce, tomato, raw onion, special sauce and from there you can add bacon, avocado, fried egg, jalapeno and and extra patty. 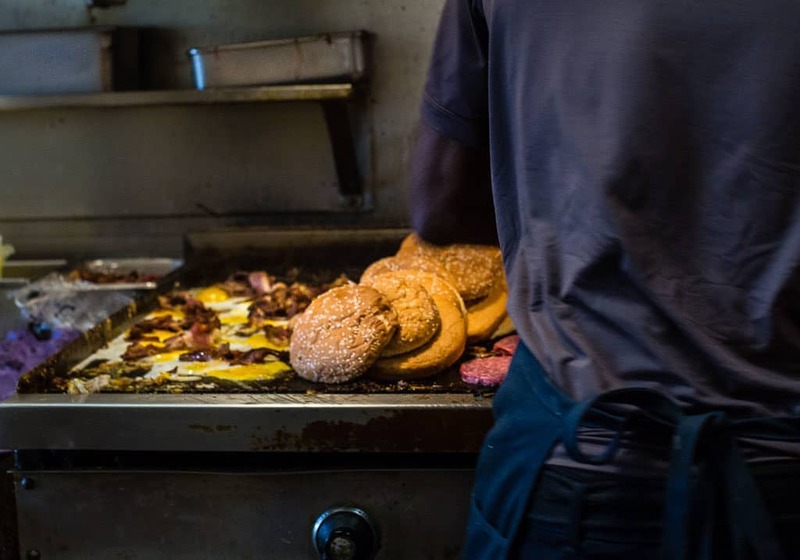 Stanich’s is a piece of Portland history. It’s old, it’s family owned and it is the opposite of pretentious. There are sports pennants and old photos and memorabilia lining the walls, it’s dark inside, and you can sit comfortably in old leather booths. 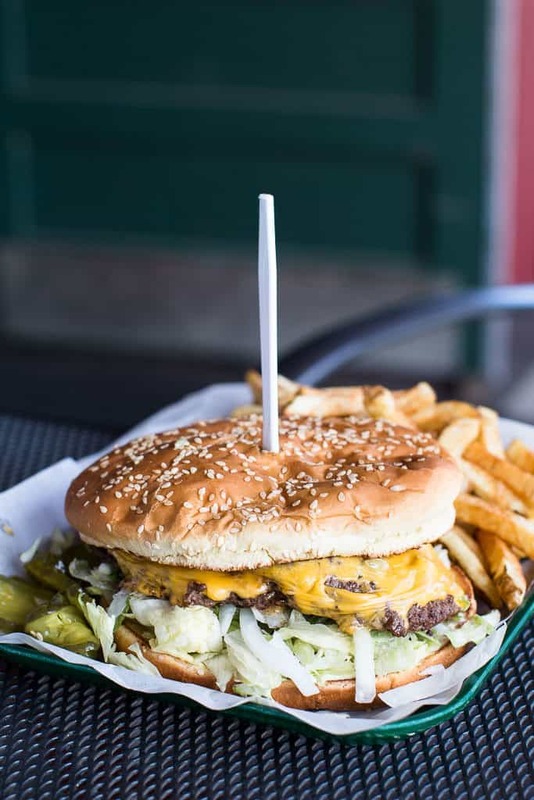 In another warmly appreciated stroke of luck for me, the cook turned to me and said, “what’d you order?” and then quietly slipped me my Nick’s with fries 5 minutes later. 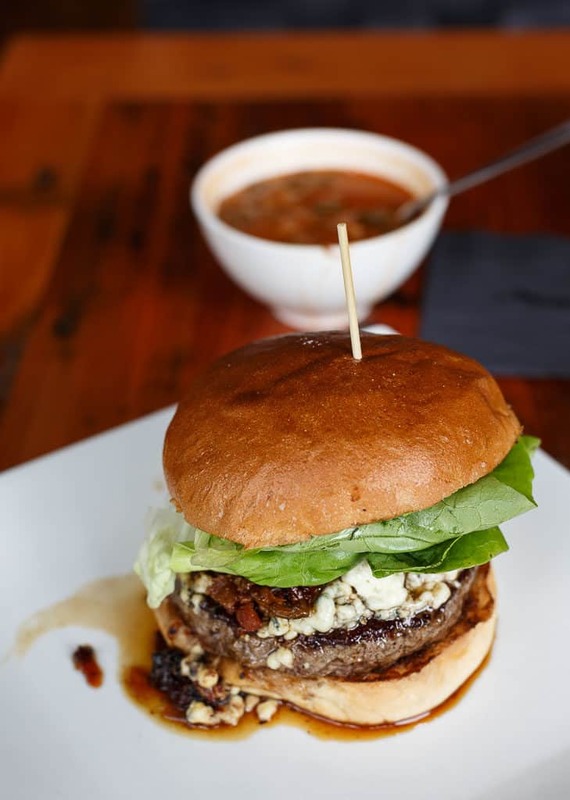 The burger was delicious and on the wet, messy side, which is how I like it. 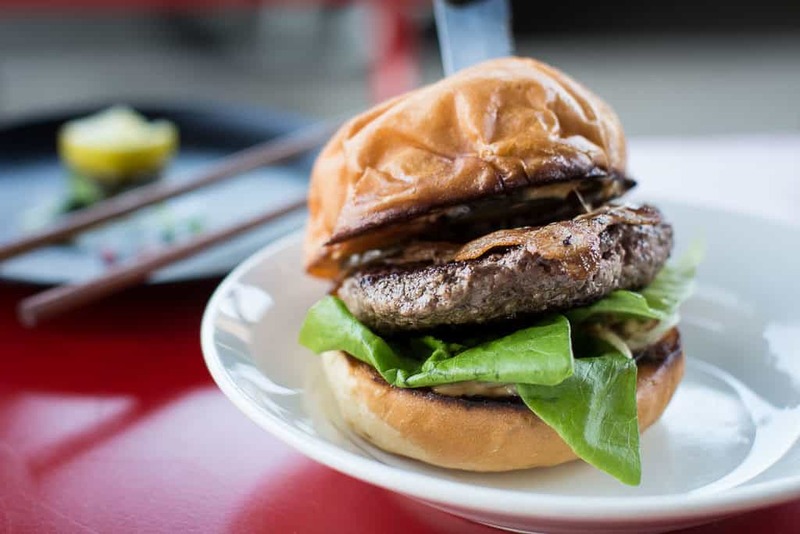 I liked the loose grind of the meat, the special sauce, the shredded lettuce and the sesame (non brioche) bun. 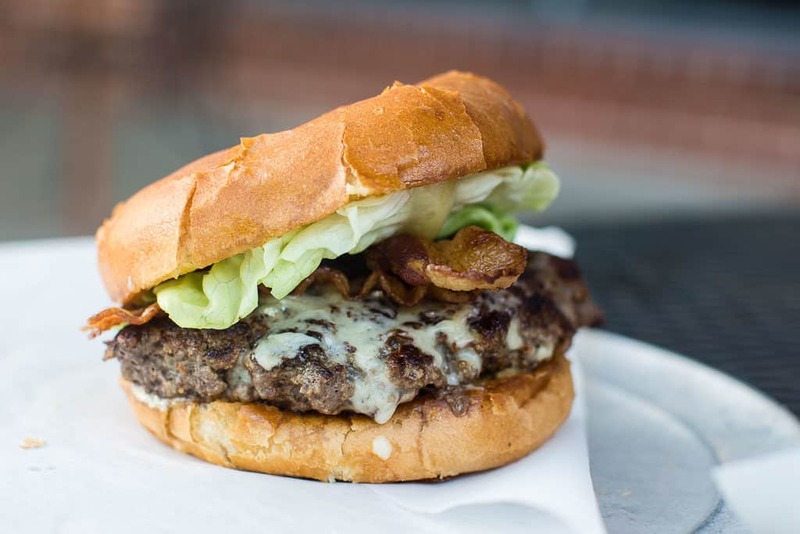 I’d definitely put Stanich’s in my regular burger rotation. I almost didn’t make it here but my boss’s son, who’s technically also my boss you see, mentioned Woodsman twice as a place I should check out. 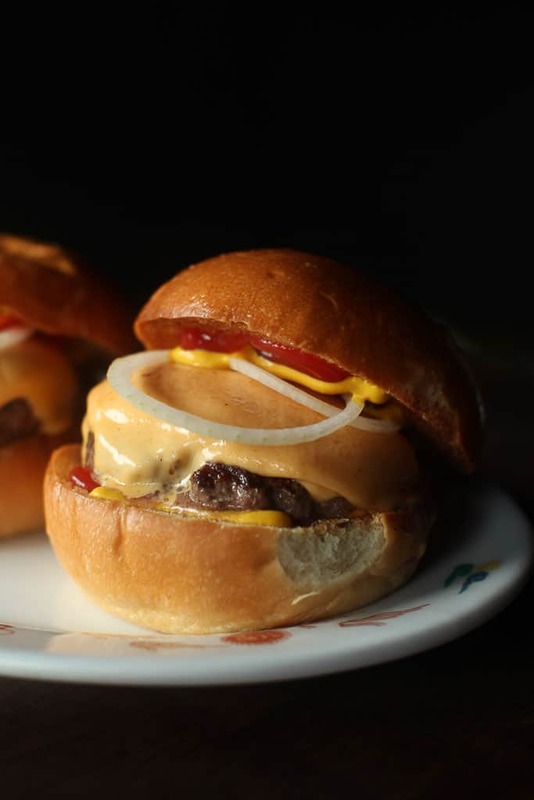 Now that ultimate bond of trust exists that nothing can disturb, the burger lover’s bond. This was a great, great burger. 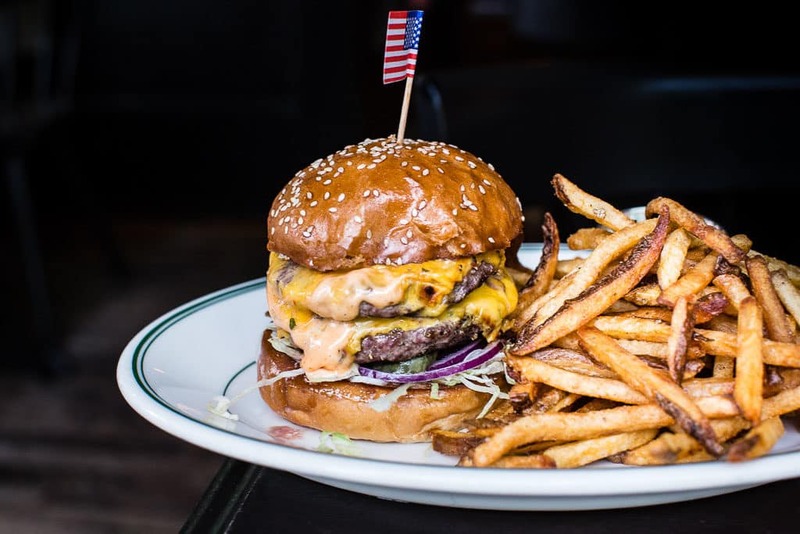 It’s double cheeseburger made with grass fed AND dry aged beef, shredded iceberg, thinly sliced raw red onion, pickles, sauce, American cheese and fries. It had that primal, stinky aged-meat smell and it arrived nice and hot and dripping wet. Also please note that the fries were spectacular. 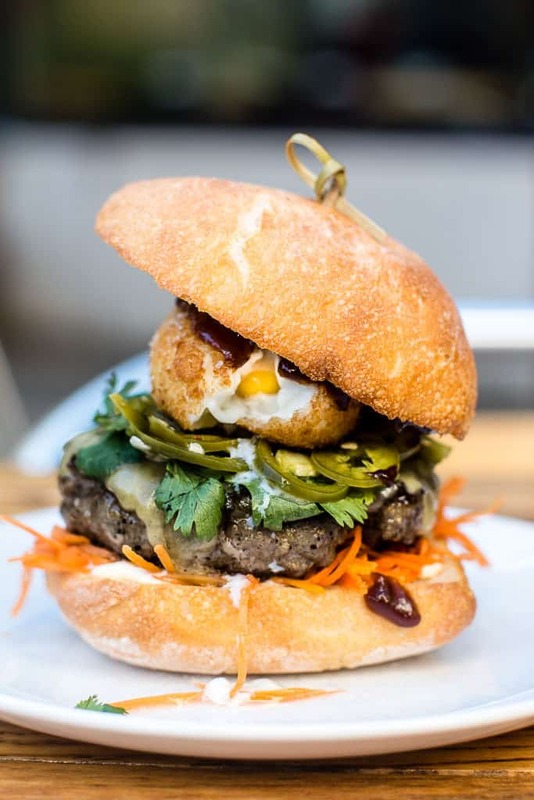 Of all the burgers that hit me to the core, Expatriate’s is the only one that wasn’t in the double-patty-saucey-no vedge genre. The moment my plate landed at Expatriate I just sighed . . . . “oh yes.” Just look at them. Each diminutive 1/4 lb. 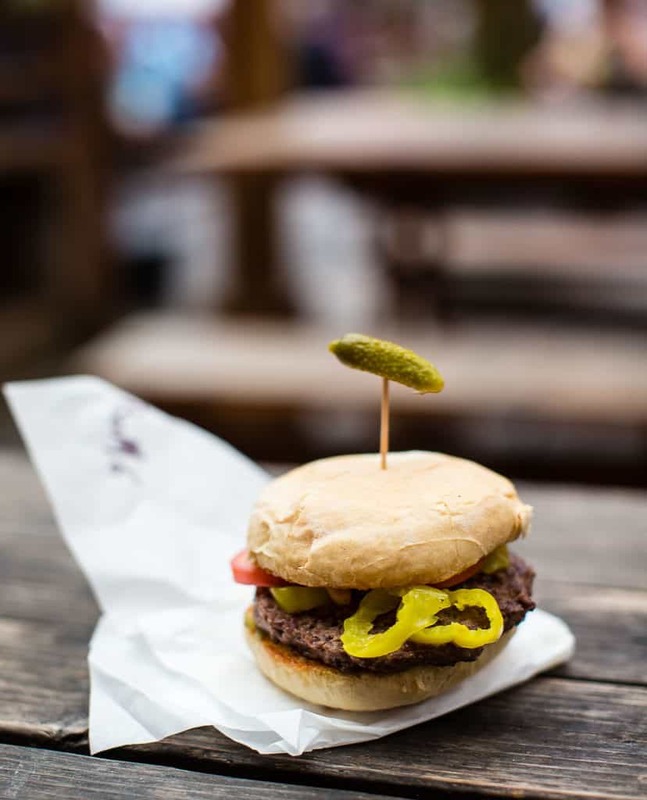 burger is a piece of artwork: perfect in scale, minimalist in garnishes with two phantom white slices of onion, and finished off with those bold contrasting primary colors of red ketchup and yellow mustard. 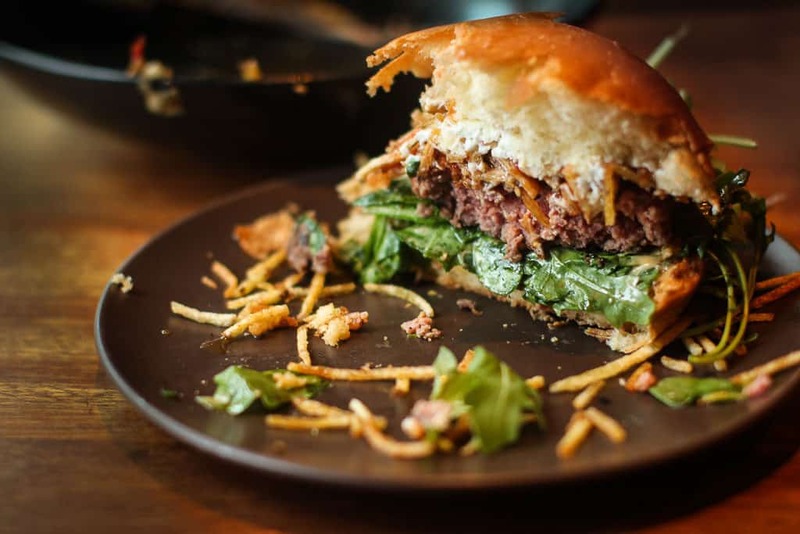 Expatriate is small, dimly lit boozy space that sports an exotic, slightly baroque and mysterious vibe, and they are the only restaurant that I know of that serves the irreplaceable James Beard Onion sandwich. Definitely worth several visits. 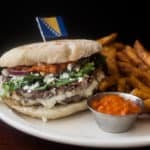 Bunk Sandwiches is known for their wildly good sandwiches, and when I was nearly at the end of my burger research a special food friend alerted me that Bunk’s Wonder Ballroom location was serving a limited number burgers (that sacred number 12), Thursdays through Sundays only. 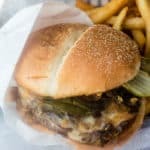 I am truly grateful for this tip, as this was one of my all time favorite burgers. 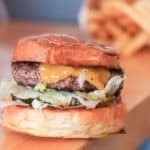 Double patty, cheddar cheese, shredded lettuce, special sauce with some kind of secret technique or ingredient that produces the most umami, almost crisp, mantle of burger crust. 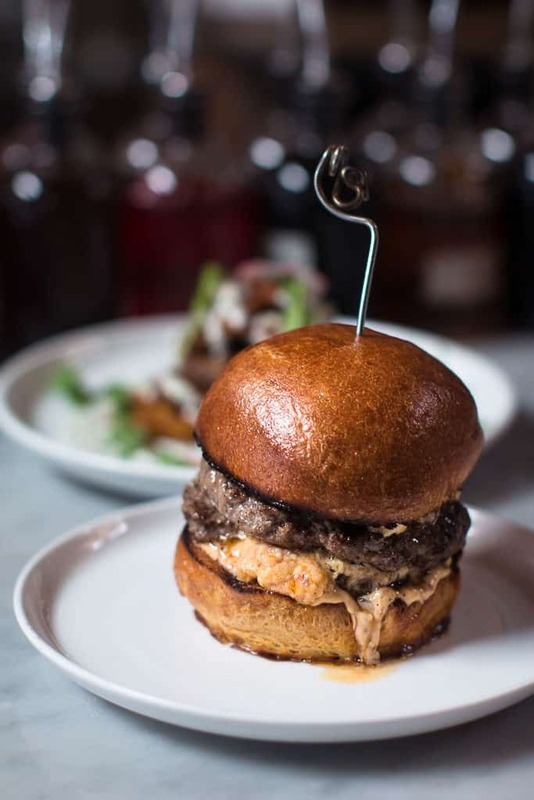 Bunk makes an unforgettable burger, go get one. 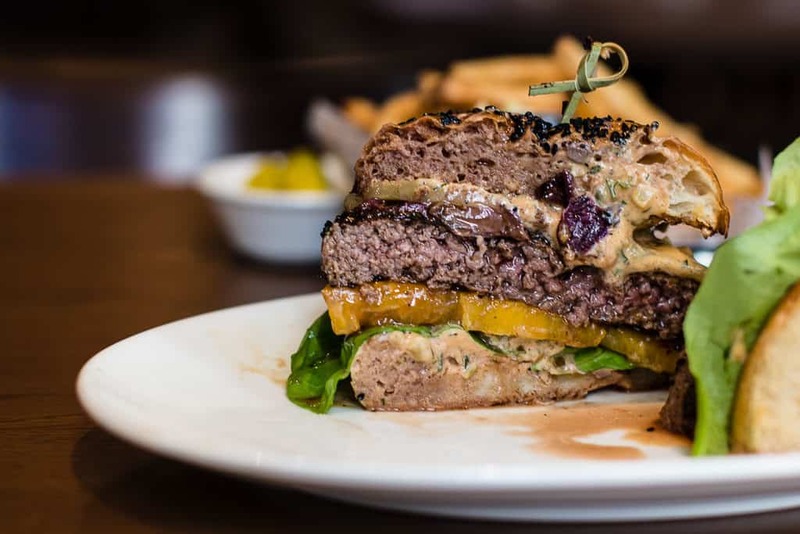 Headwaters is the restaurant inside one of Portland’s most recognizable historic landmarks, the Heathman Hotel. 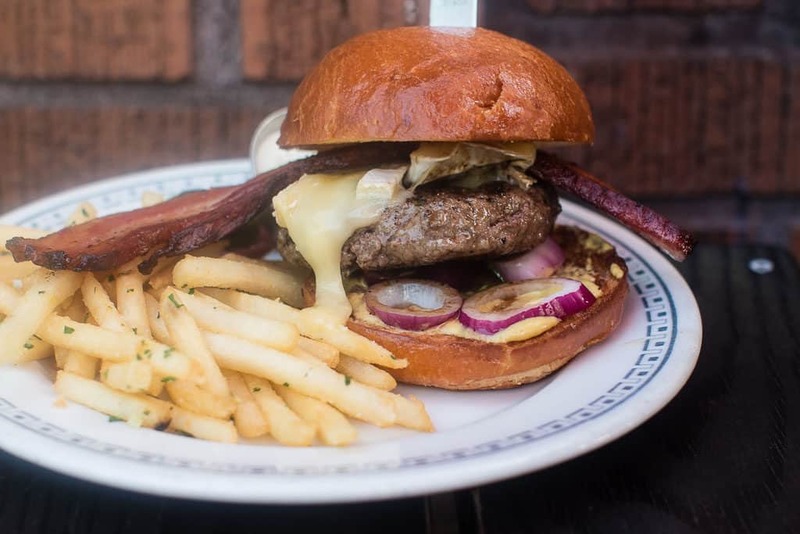 While you should know that Heathman has a notable library and wonderful contemporary art collection, not to mention the one and only Beefeater Doorman, it’s just as important to know that Headwaters makes a burger for the ages. 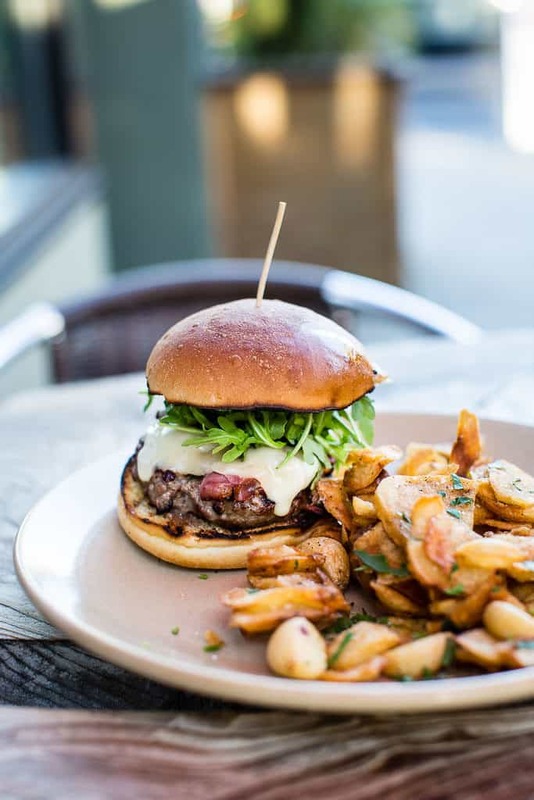 Headwaters is helmed by Husband-and-wife team Vitaly and Kimberly Paley who have been pillars of the Portland restaurant world since 1995, when they opened Paley’s Place on NW 21st Avenue (another top burger in my list). 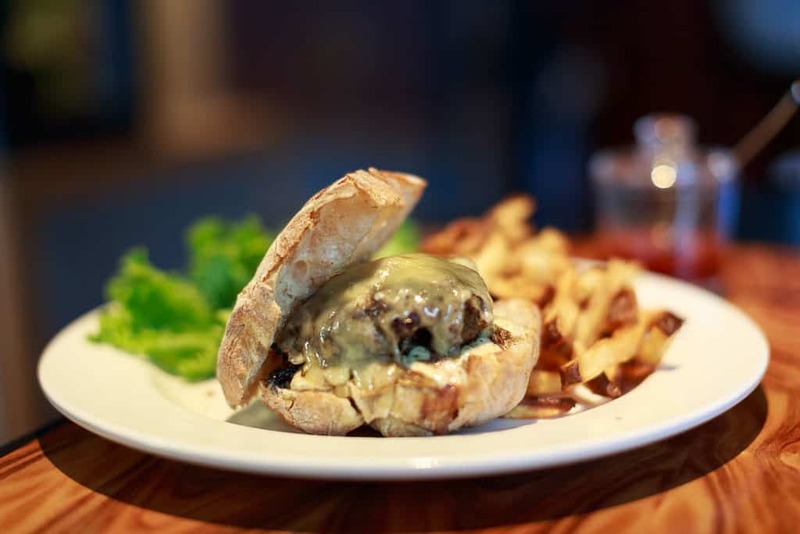 Vitaly is a James Beard Foundation’s Best Chef Pacific Northwest award recipient (2005), as well as Semifinalist for Outstanding Chef (2012), and Headwaters is the Paleys’ fourth restaurant in Portland. 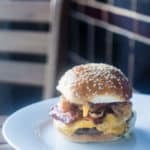 Let’s talk about one of his burgers. 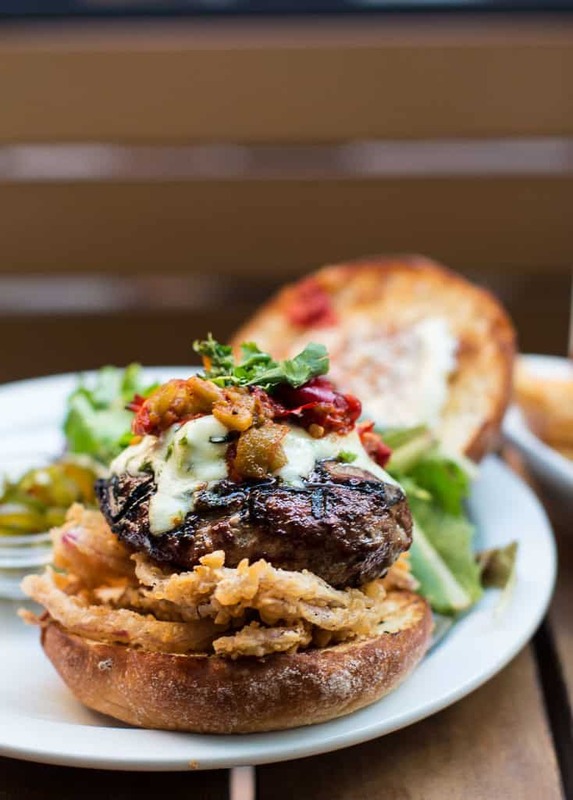 The Headwaters burger is the only burger with a tomato I’ve not removed onto my plate. Why? 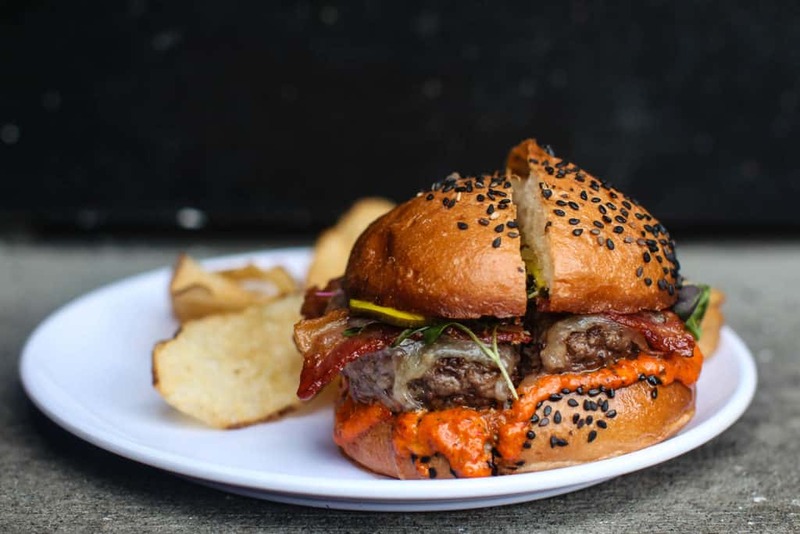 It’s an heirloom tomato full of flavor and, commingled with that luscious meat juice, disintegrates the bun into just the right state of nothingness where it barely protects your hands from a real mess. 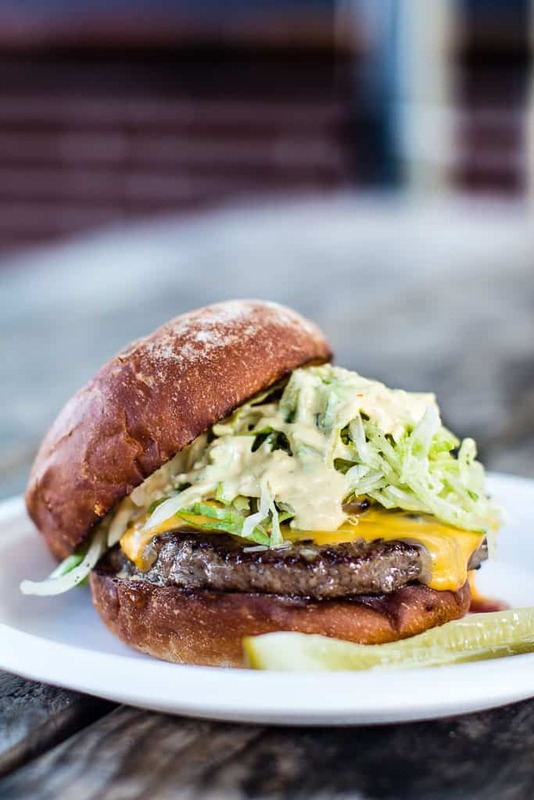 This Top Portland Burger also comes with aged cheddar, roasted onions, remoulade, lettuce, and b&b pickles. 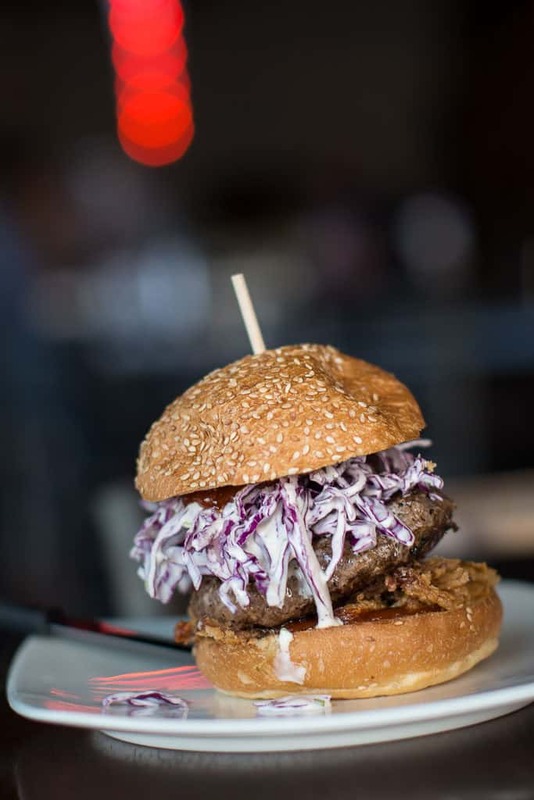 Superbite is also home to a James Beard Best Chefs (plural) Northwest award winner (2017): Greg Denton and Gabrielle Quiñónez Denton. 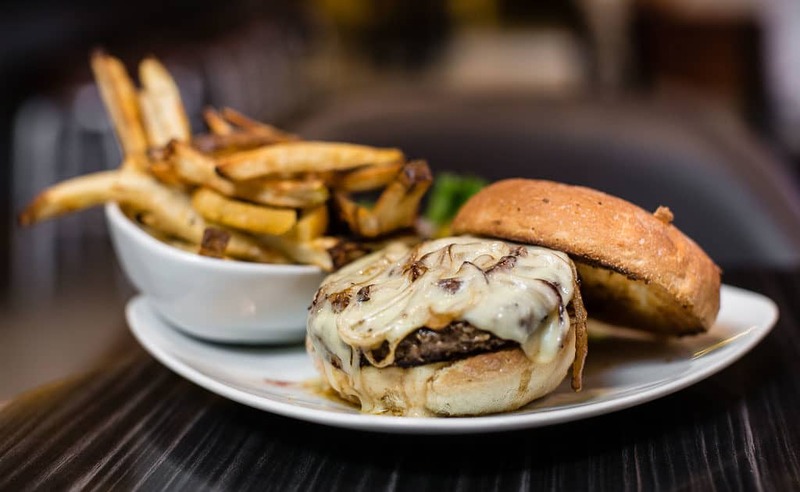 They serve a very unique burger in that shiitake mushrooms are mixed into the ground beef, the cheese is a mixture of fontina and cheddar, and the in-house baked bun has a nearly sweetish, fragile crispy laquer to it on top. 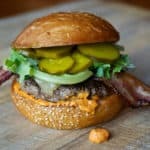 Add shredded lettuce, fancy sauce and pickles and this is the Superbite burger. 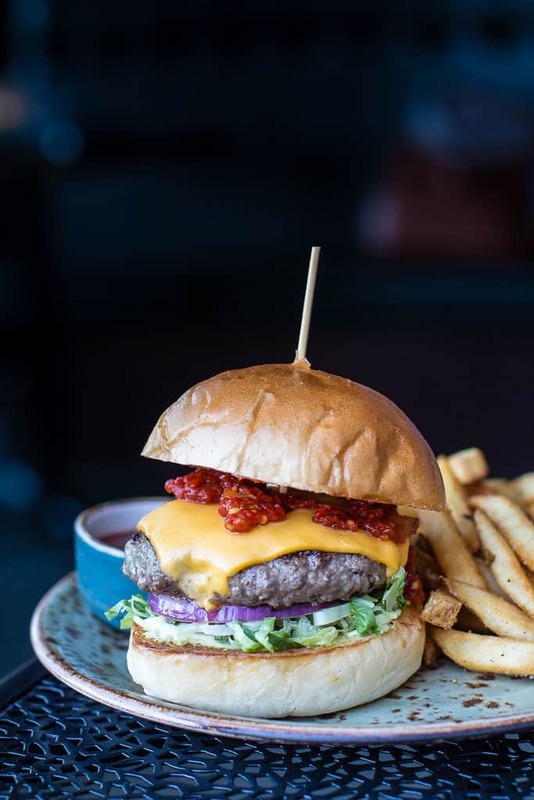 The American Local is a quirky bar & eatery in trendy Southeast Portland slinging out Asian-inspired & modern American comfort food including another one of my favorite Portland burgers. 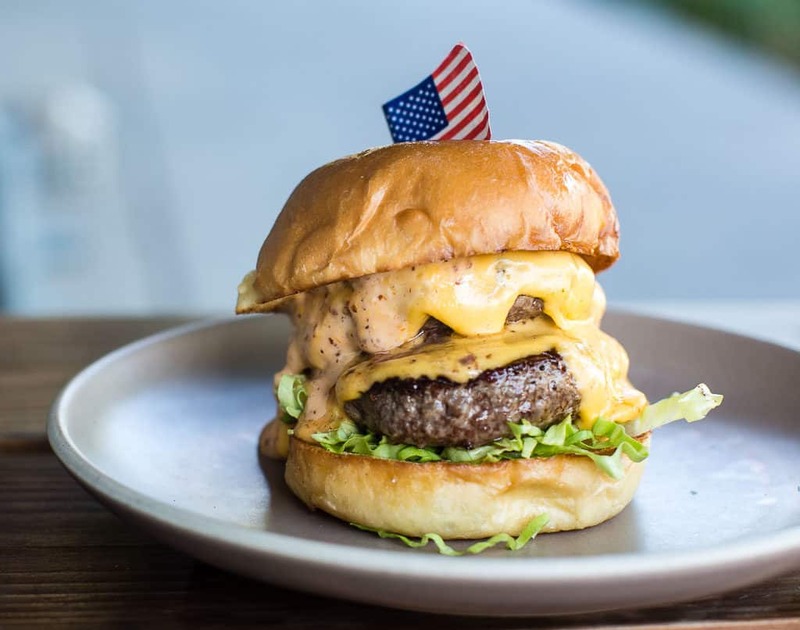 As you can see, American Local’s burger is in that double patty, nearly vedge-less genre I spoke of earlier, but here we have two smaller, thickish patties and a ton of mustard-tinged special sauce. 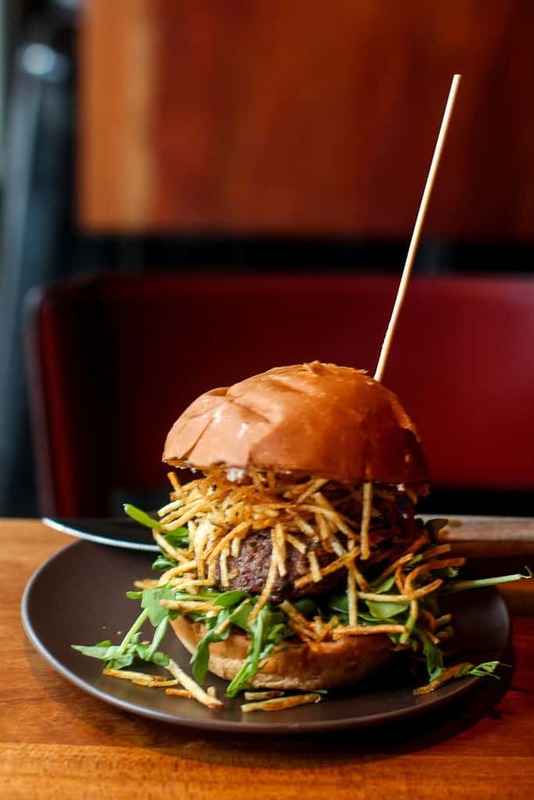 Pollo Bravo is the younger cousin of Toro Bravo, the wildly popular and distinguished Spanish-esque restaurant, who set up shop in Pine Street Market in 2016. 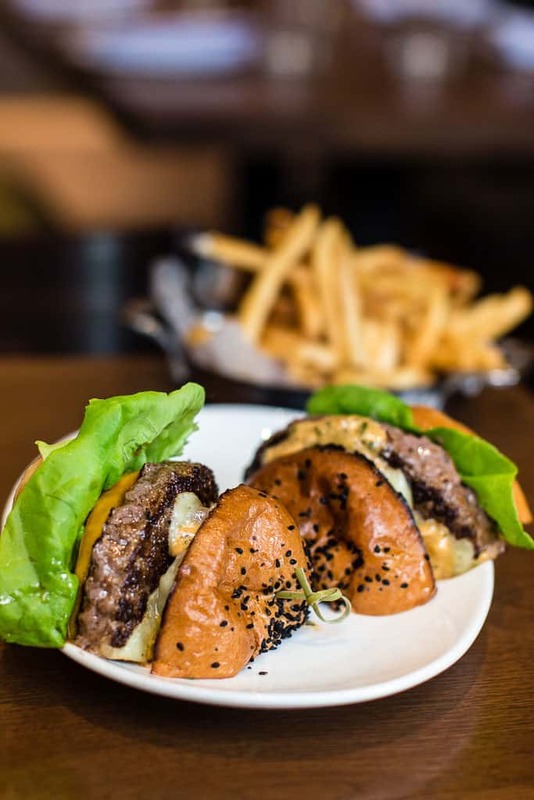 This burger has an addictive romesco sauce, is served with thinly sliced avocado and sprouts and comes on a wonderful black-sesame seeded bun. Adam and Jackie Sappington run this very popular dinnerhouse and bar that focuses on whole animal cookery. 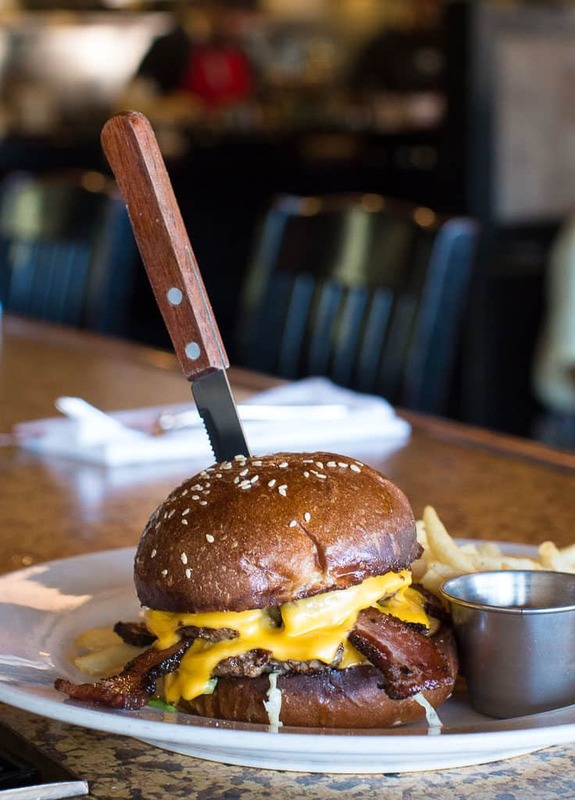 It’s nearly impossible to get into Country Cat at brunchtime, but if you slip into the bar and sit at the counter early in the evening, you can get a deeply primal, funky smelling burger in the double-patty vedgeless genre, with housemade bacon, for a great value. Lay Low Tavern is an old, dark dive-bar/lounge in the Foster/Powell neighborhood that was recently revamped and re-conceptualized by two modern restaurant renovators. It’s so dark inside Lay Low that you can’t read the menu. You can still smoke on the patio. 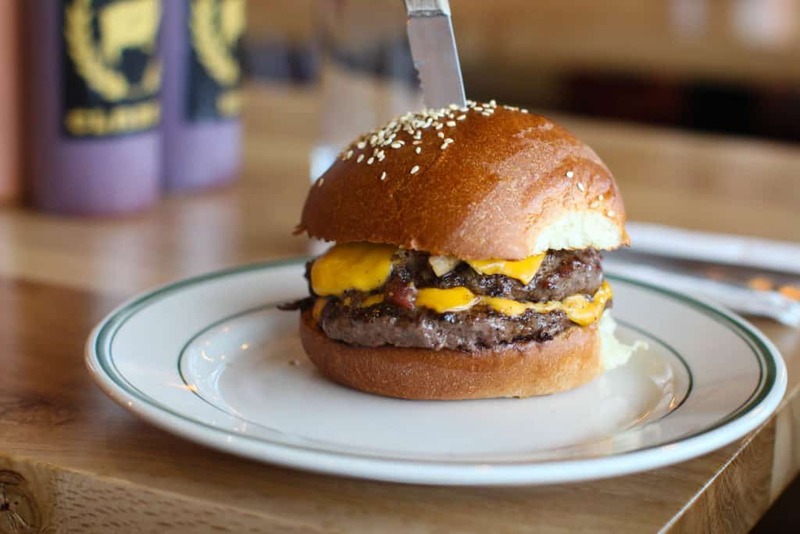 More importantly, you can get one of Portland’s best, simple burgers here. Meat, lettuce, tomato, raw onion, pickle and cheese, wrapped in paper. 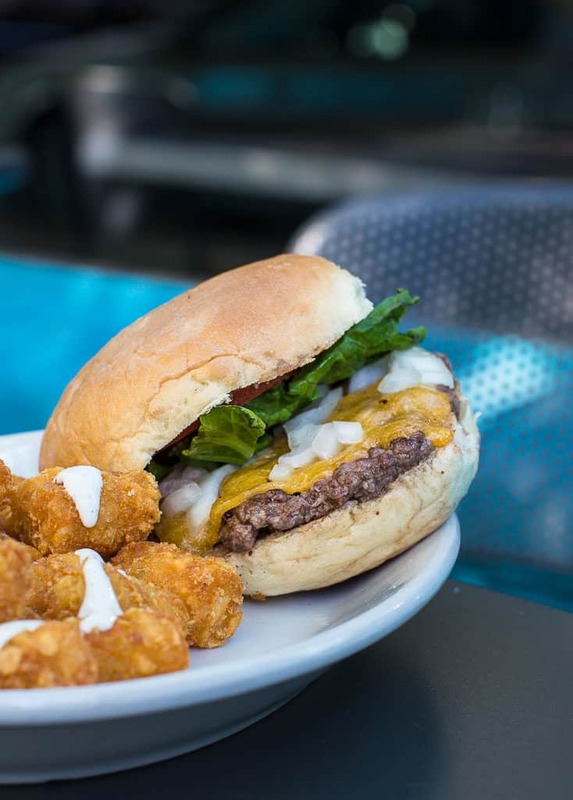 Get fries or tater tots for a complete, no-frills, escape-the-crowds dining experience. I love this place so much. It’s a small, neighborhood place for “fine food and libations” on a corner and away from the larger restaurant neighborhoods that are thronging with people at all hours. 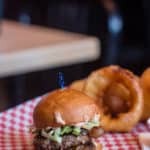 They have great deviled eggs and boquerones, delicious mussels and a lamb-neck French Dip sandwich, and one of Portland’s best burgers. 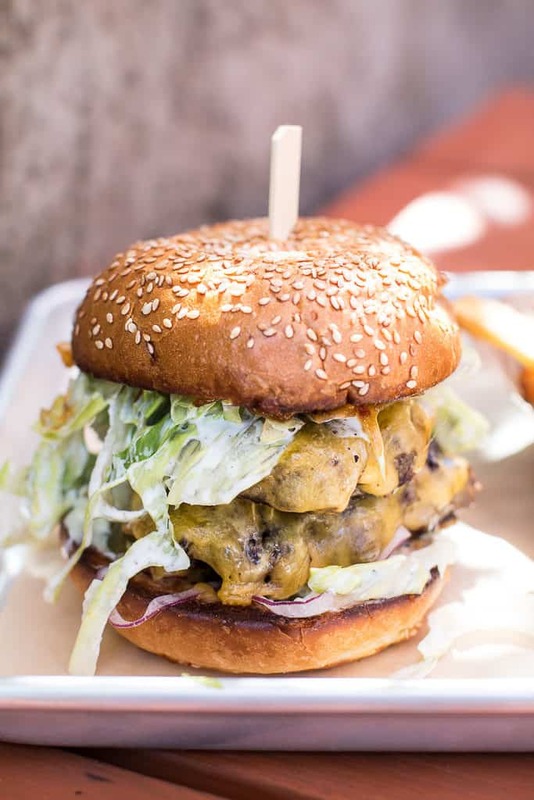 In fact, this burger is probably in my Top 5. 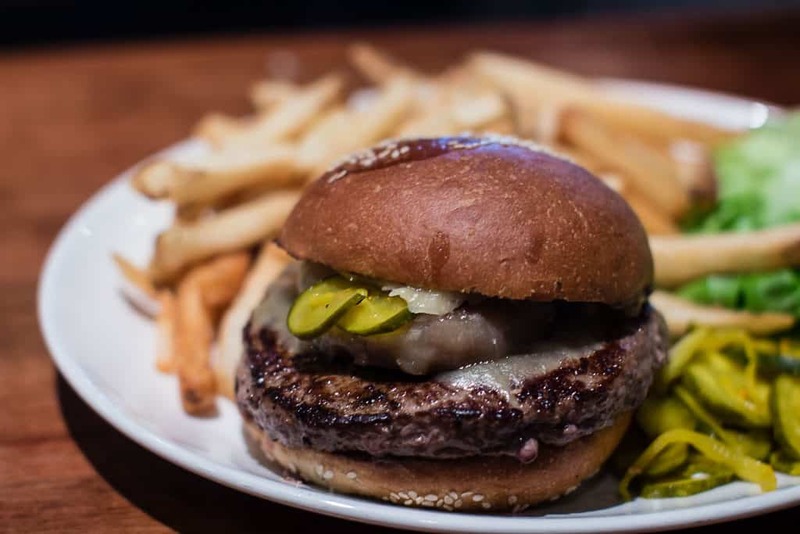 What sets this burger apart for me, besides the quality and flavor of the meat, is the thickish, sturdy, almost burnt crust, which balances well with the bleu cheese and pickles. I go here often and you should too. 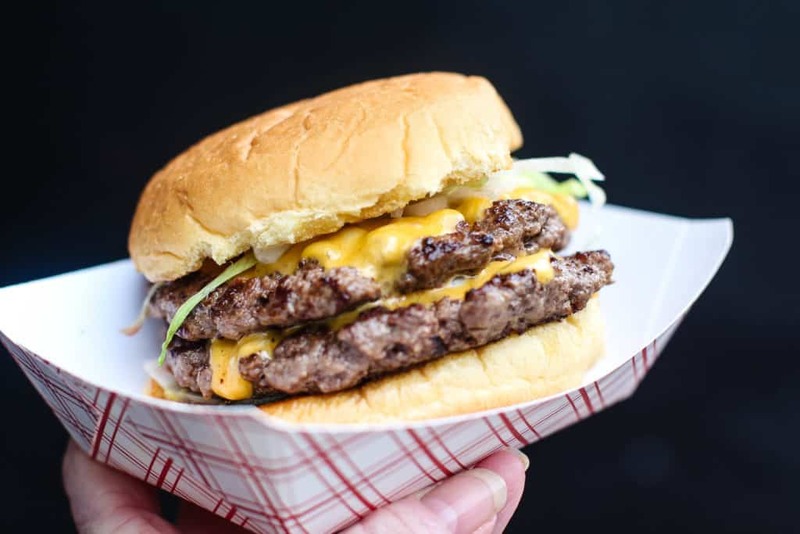 When a nice, handsome and young man with a kind smile who is the age of your only son, cooks and serves you a delicious burger from a food truck that is on your direct path home on your work commute, you’ve found a personal favorite. 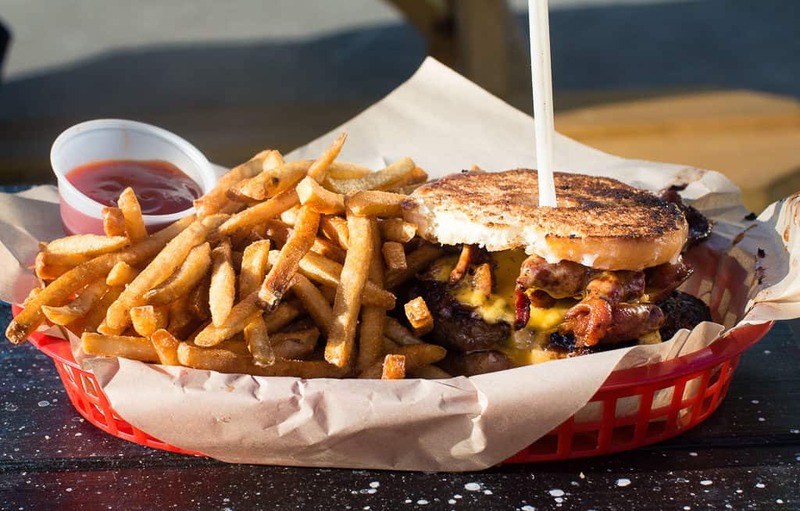 Pastrami Zombie is my soft spot burger place, and I’d hedge a bet it will be yours soon, too. Read all about this fast and fantastic burger here. 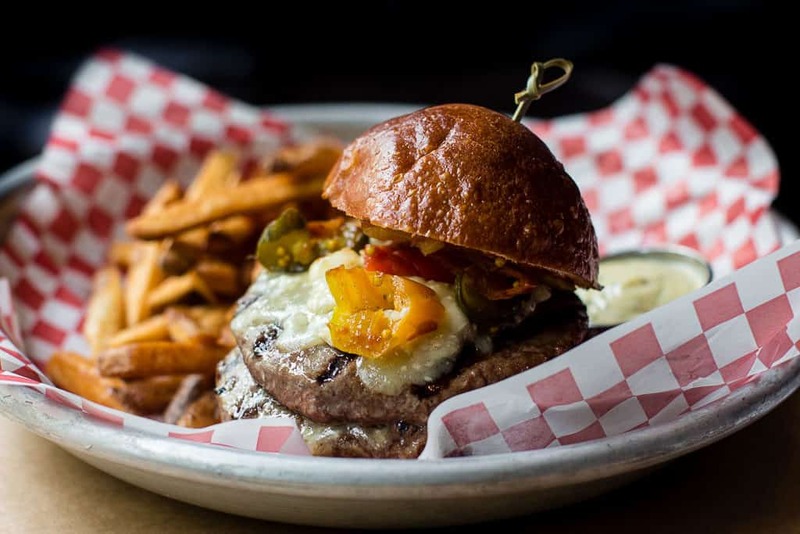 Paymaster is a low-key bar in the Northwest neighborhood, with a throwback ambiance and serving pub food including a wonderfully simple burger with cheese, raw chopped onion, lettuce, tomato, and pickle and served with tater tots. Tabor Tavern is another neighborhood (Mt. 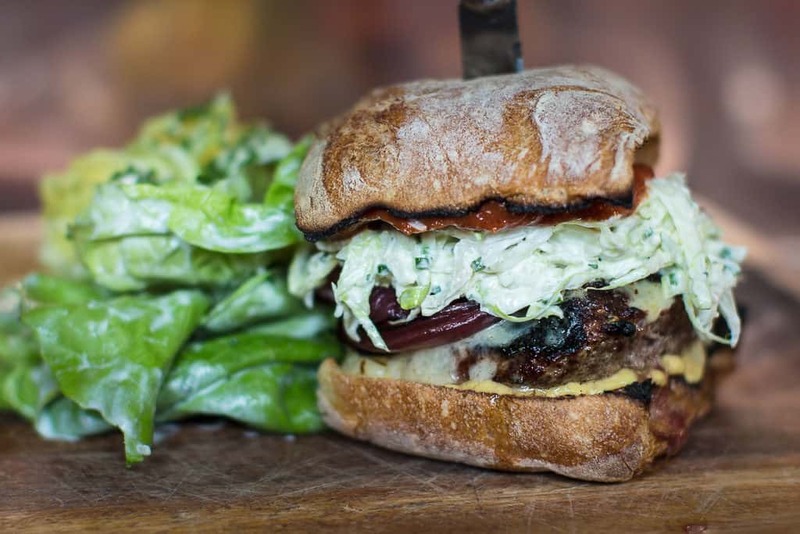 Tabor) pub with great gastropub fare in a rustic, wood-decked setting, featuring outdoor tables, multiple TVs and a delicious classic style burger with a 1/2 lb patty, shredded lettuce, and Russian dressing on a brioche bun. 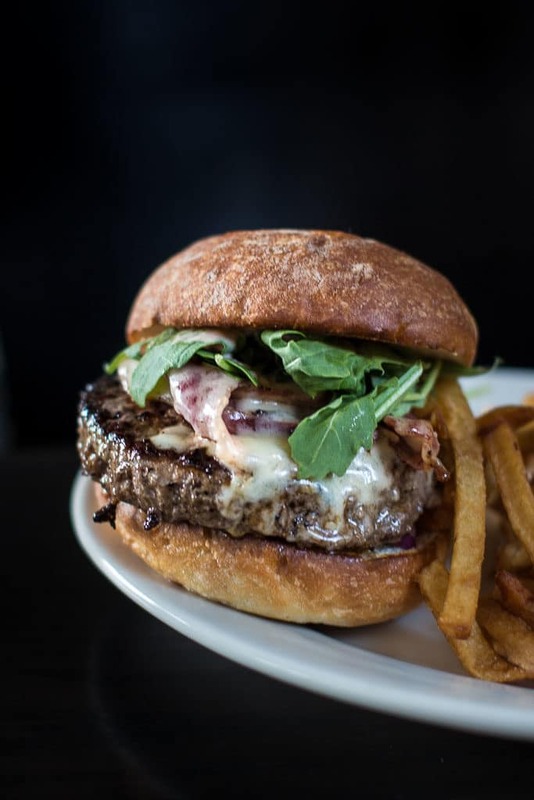 This is the burger that pushed my “Portland proper” rule to the rolling country hills of Hillsboro, where I found a delicious, classic style burger nearly the size of a small hubcap. 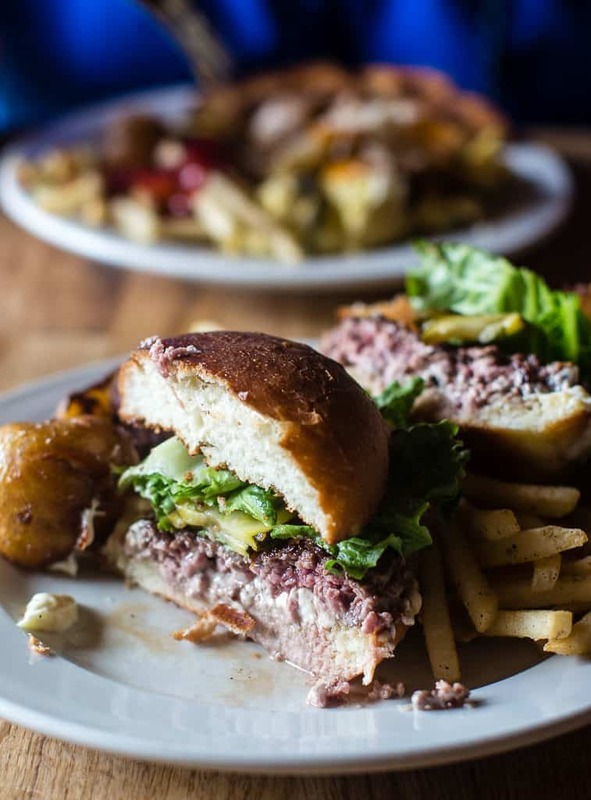 Featuring a giant thin patty, American cheese, dressing, shredded lettuce and pickle, Helvetia Tavern serves one of Portland’s most commonly named best burgers in a lovely farmland-esque setting. 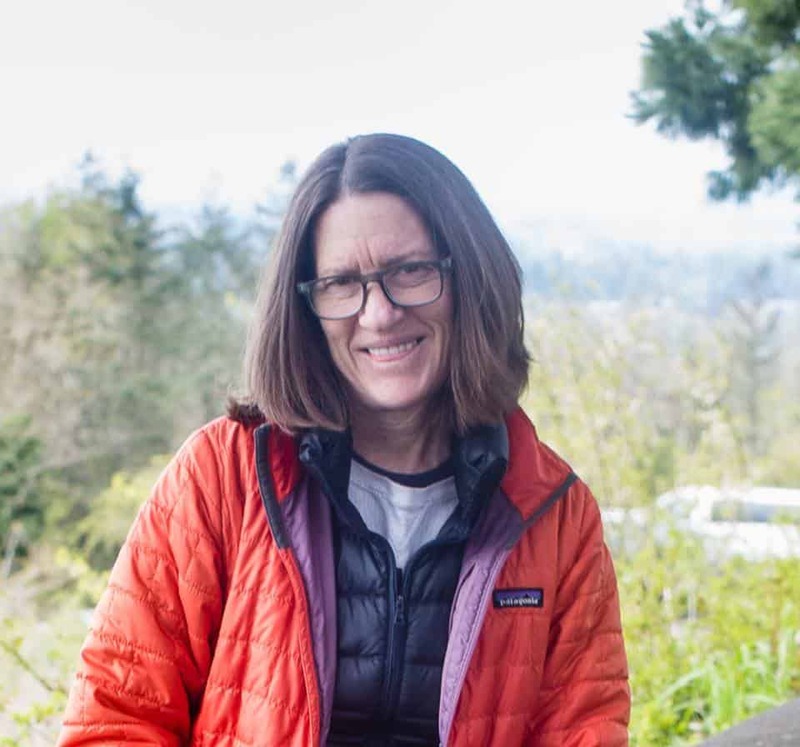 Le Pigeon home to another James Beard award-winning, pedigreed Portland chef: Gabriel Rucker, who also runs Little Bird Bistro. 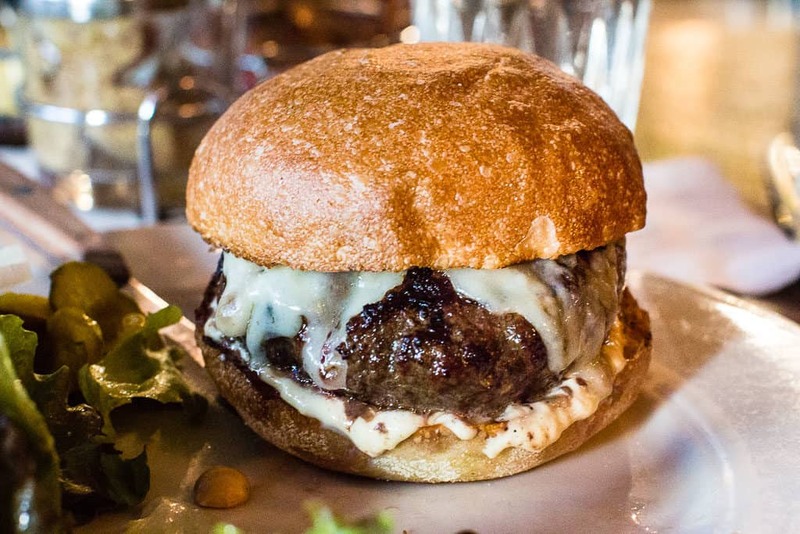 It’s the only place I know of in Portland where you can get foie gras, beef cheek bourguignon, dry sherry and a burger that riffs off of Wendy’s. 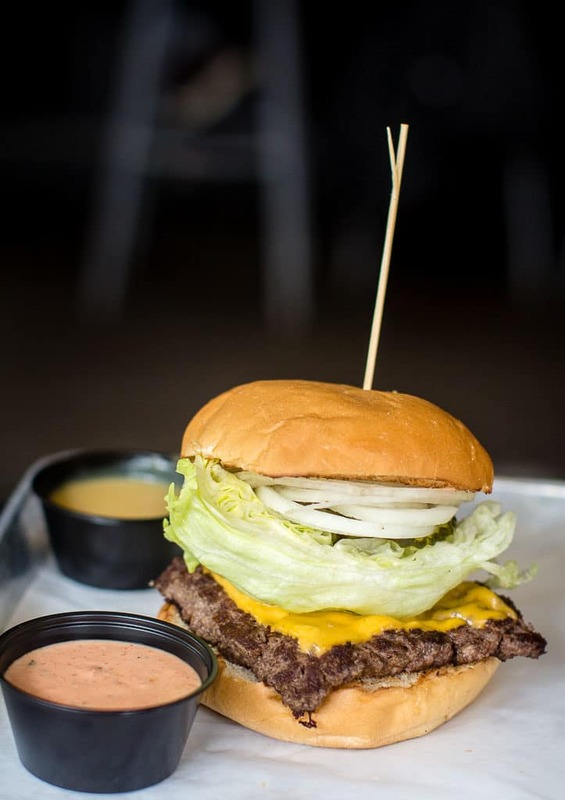 There are a very limited number of these square patty burgers per night, and they come with grilled and pickled onions, extra sharp white cheddar, iceberg lettuce, and spicy dijon aioli. This was by far the messiest burger I ate, and very worth it. 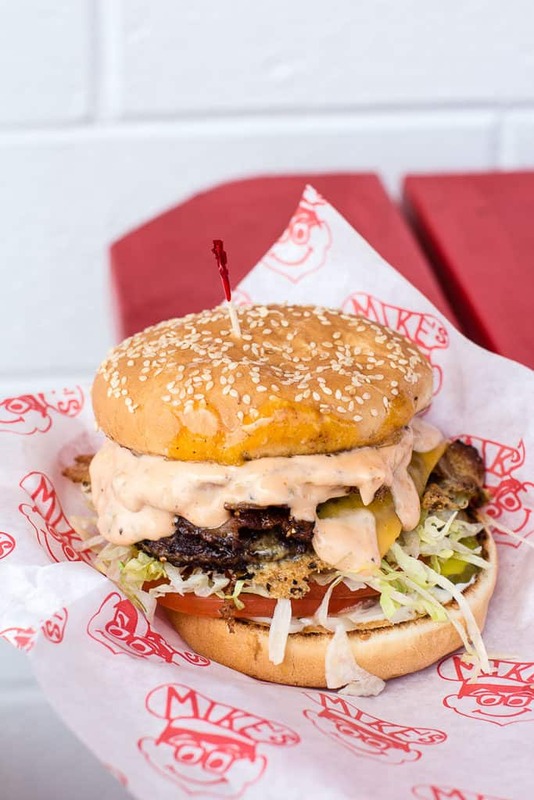 With a face like this, who can resist a Mike’s Drive-In Burger. 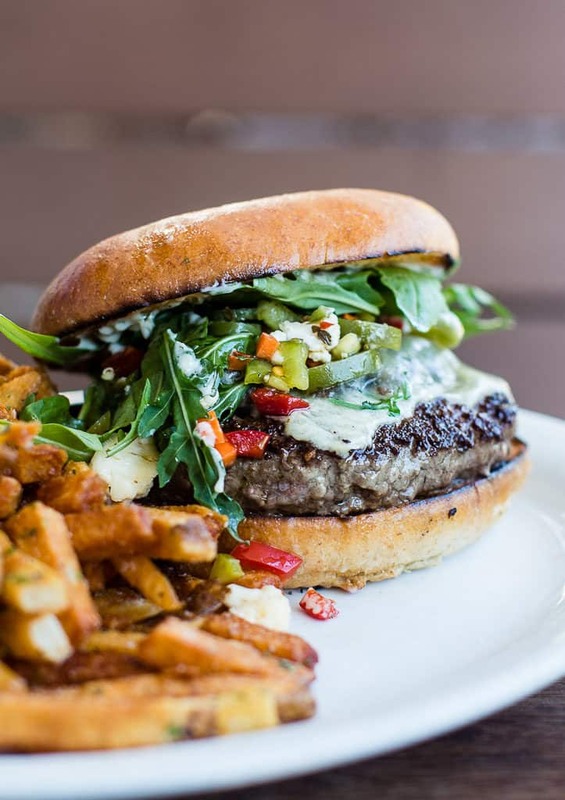 This classic-style burger with all the accompaniments and a ton of sauce, is the burger you want after a long run or bike ride, and will send you diving for bed in the hopes of a long nap. 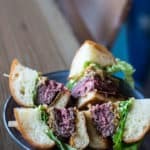 Smokehouse Provisions is where I break my rule regarding “Portland city proper” and hop over the bridge, still within “Portland greater metropolitan area,” to Vancouver, WA, where owner and Executive Chef B.J. 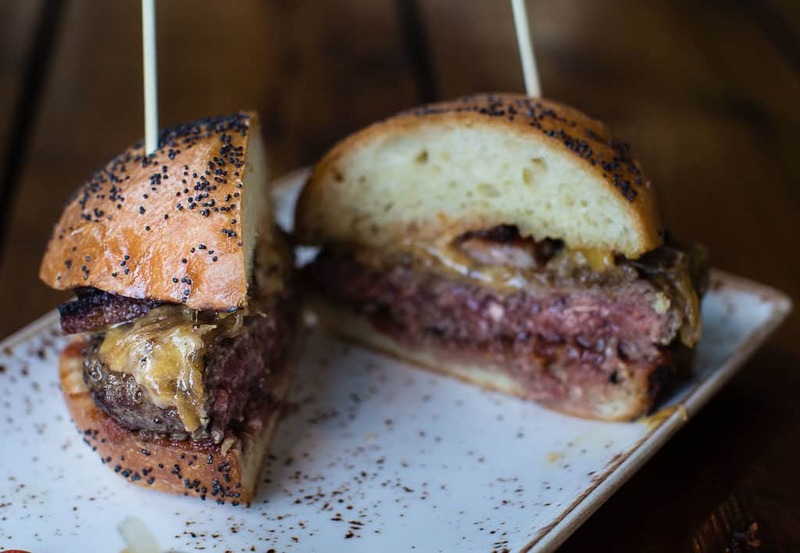 Smith dishes out a burger enhanced with smoked bone marrow butter and bacon onion jam. 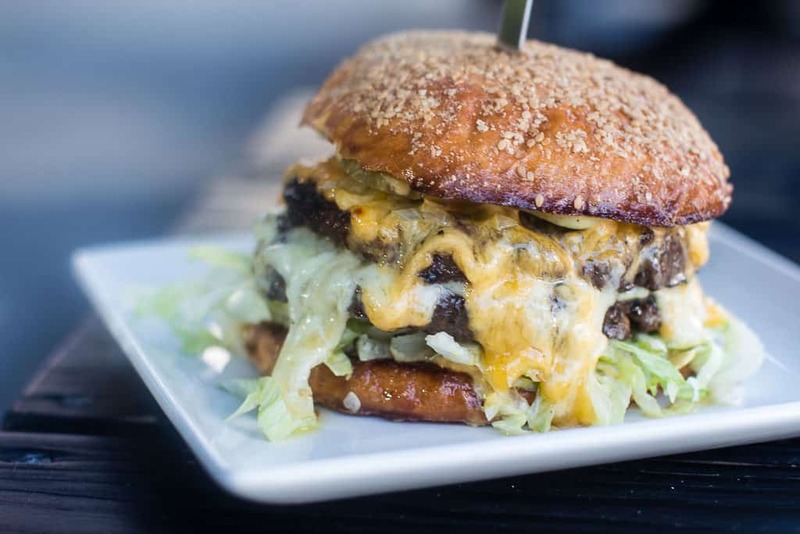 It’s too good of a burger to not include in my list of Portland’s best burgers. You’ll agree. 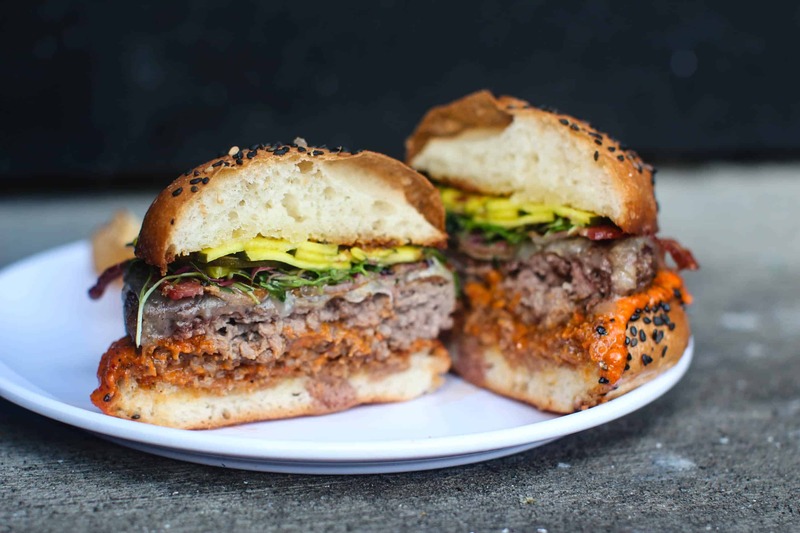 Guero started as a humble food-pod cart and this year moved into a brick and mortar restaurant. 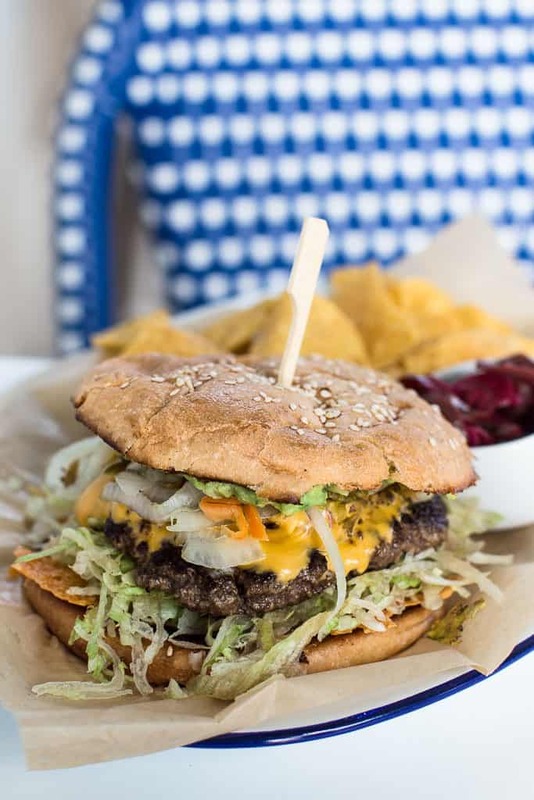 Their version of a “Mexican street hamburguesa” comes loaded with a chicharron queso, American cheese, tamarind tomato, habanero coleslaw, guacamole, pickled jalapeno, shredded iceberg and mayo. 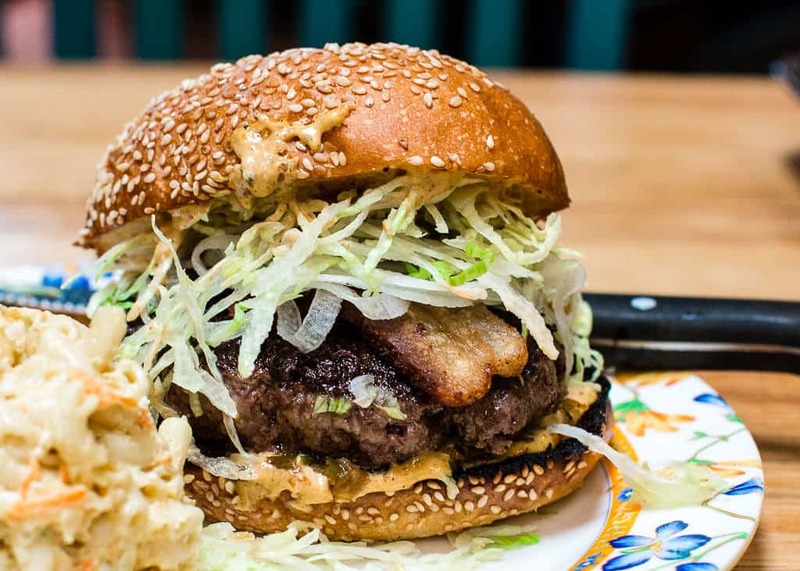 This is the one maximalist burger even a purist will love. Meat: Medium thick patty, 1/2 lb. 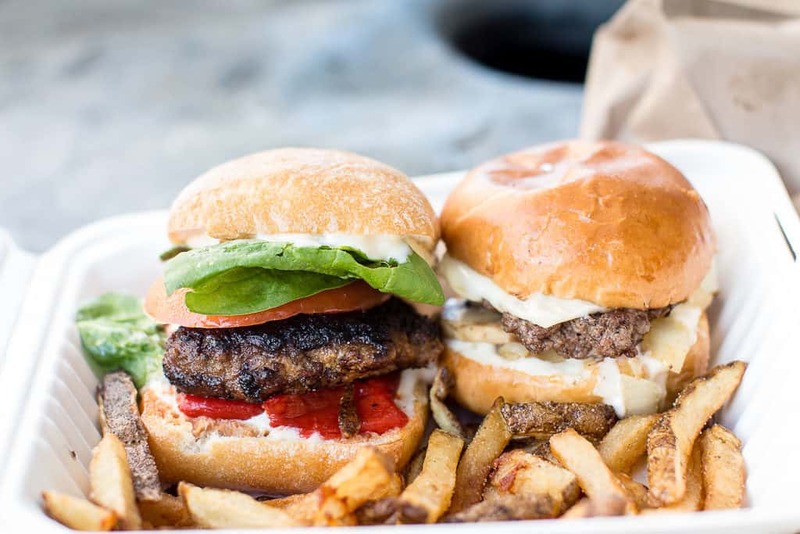 Boise Fry Company For modern, mix and match, and make-your-own burgers and every color and cut of potato fries(1902 W Burnside St, Portland, OR 97209//(503) 946-1849). 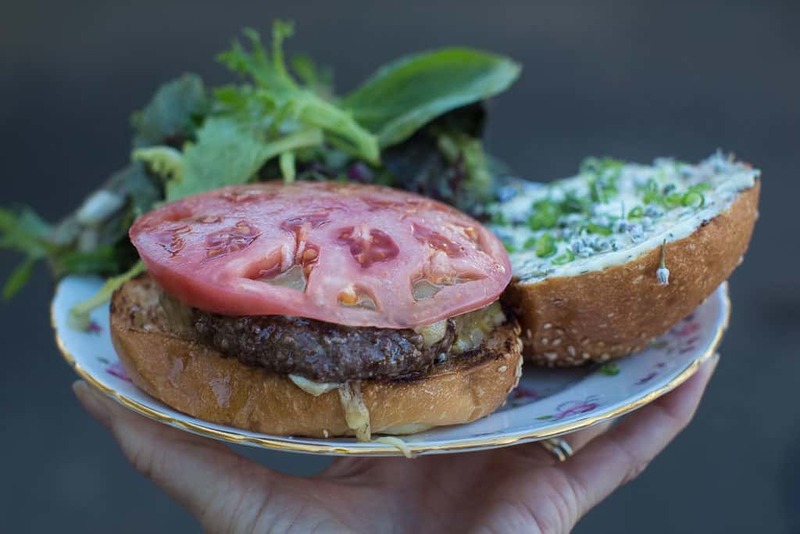 Holstein’s Shakes and Buns (CLOSED)For inventive burgers in a bright, fun space (1139 NW Couch St, Portland, OR 97209//503) 616-4321). 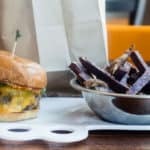 Little Big Burger: For the smaller appetites, includes veggie option (Various locations). 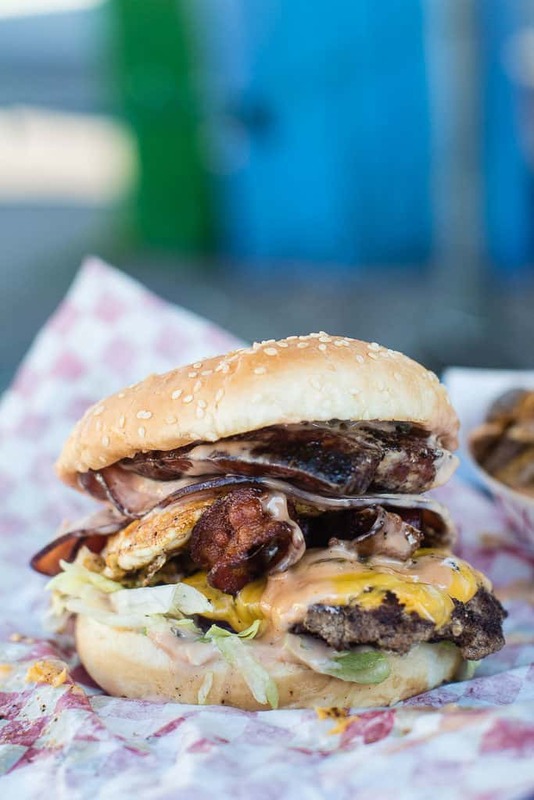 Killer Burger: King of the Peanut Butter Sauce Burger; Loud music, TVs and grass-fed burgers, always including bacon and fries (Various locations). 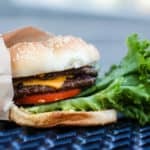 Burgerville: Dependable and tasty fast burgers and seasonal sides and shakes (Various locations). Good list! Definitely gave me some need ones to try. I am curious of what you thought about Yakuza. To me that is top ten, but I am curious why you didn’t see it farther up the list. Anyway thank you for this great read!